Ballerina are the perfect footsies. Simple and versatile, they are fitted with a heel that offers extra grip for dancers and for everyday, regular activity also. 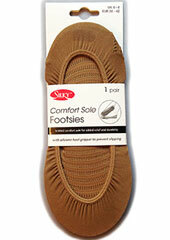 The best way to add something extra between you and your shoes and give you a longer lasting comfort throughout the day. Rating: 5 These really stay put. Very happy with them. Rating: 3 Not low enough very visible on shoes. It's ashame as quality is good. Rating: 5 As I have grown older i have found it more and more uncomfortable to wear shoes without tights or socks: my feet become too hot, or too cold. I am susceptible to blisters and chaffing. These are the only footsies I have found that remain invisible in fashionable shoes. They also actually stay on my feet and do not slip off due to the silicone grip inside the heel. I am really pleased with them. They beat any other footsies I have tried and, although quite expensive, they are the only ones I buy now.